The ribbon has been cut on a new £6m investment designed to help one of Harrogate’s largest employers double turnover by 2021. Belzona Polymerics’s 170 employees were joined by the Mayor of Harrogate for an opening ceremony on Thursday, unveiling a new 40,000 sq ft training and distribution facility on Claro Road. Last year saw more than 360 people travel to the site for training from across the world, with the additional space the company will be able to offer additional and more advanced level courses. 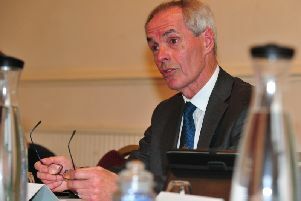 These will be needed to support the company’s 2021 target, said engineering director David Blackwell, who also pointed to the benefits that training could bring to the district. “If we are doubling the business, we need to double the technical support as well, and that takes a lot of training,” he said. “Belzona is a significant employer in Harrogate, and has been since the mid-50s. “Because we are expanding, it opens more opportunities for employment for local people. And because of the training centre and being a global company we bring people in from across the world. The company produces industrial protective coatings and engineering composites for several sectors, including the mining and marine industries. President Joel Svendsen said: “We already had training facilities in our other building but now with this we are adding additional and larger training facilities. “We will have people coming to this facility from primarily Europe but also from across the whole world. “Training is key for us; Belzona is very much a knowledge business.